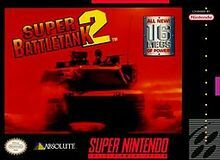 Super Battletank 2 for Super Nintendo allows you to control of the M1A2, an even more advanced and deadly machine than you piloted in SUPER BATTLETANK. As you go deep into enemy territory, you'll face a barrage of enemy aircraft and land-based attack vehicles this is where a smokescreen might come in handy. And if you're being pummeled from above, climb topside and take control of the powerful Phalanx machine gun to clear the skies.